Conker’s Bad Fur Day is an action-platform video game developed by Rare for the Nintendo 64 (N64) video game console. It was released on 5 March 2001 in North America and on 6 April 2001 in Europe as part of the Conker video game series. 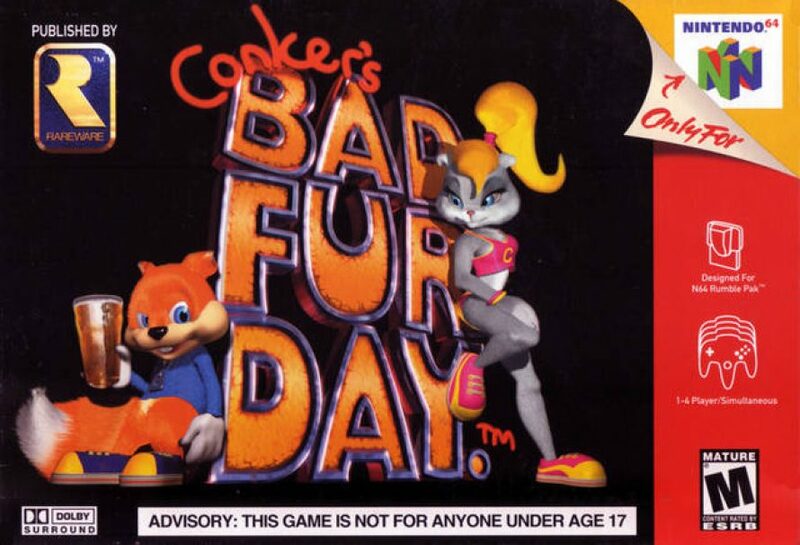 Although visually similar to Rare’s family-oriented Nintendo 64 platformers, the content of Conker’s Bad Fur Day is designed for mature audiences. The game contains graphic cartoon violence, alcohol use, tobacco use, profanity, vulgar humor, dark humor and pop culture references, including several film parodies. Conker’s Bad Fur Day follows the story of Conker the Squirrel, a greedy, heavy-drinking red squirrel who attempts to return home to his girlfriend Berri. 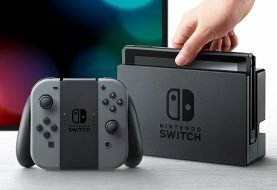 The gameplay is composed of various challenges involving platforming, solving puzzles, fighting enemies, and gathering objects. These challenges are split across multiple chapters, each with a different theme. The game also features a multiplayer mode where a maximum of four players can compete in seven different game types. The game was in development for four years and was originally intended for a family audience under the title Conker’s Quest, then retitled Twelve Tales: Conker 64. However, the prototype fell under criticism, being deemed both too cute and similar to Rare’s earlier platform games. Rare was influenced by this reception and decided to retool the game for mature audiences. Conker’s Bad Fur Day received critical acclaim from video game journalists, who praised its visual appeal and smart, funny humor, but sold well below expectations due to limited advertising and a release towards the end of the Nintendo 64’s life cycle, but earned a cult following due to its unique styling. A remake, Conker: Live & Reloaded, was released for the Xbox in 2005. In 2015, the game was included as part of the Rare Replay compilation for Xbox One. Conker’s Bad Fur Day is an action-platform game where the player controls Conker the Squirrel through a series of three-dimensional levels. The game features an overworld where players can transition from one level to another, although many are initially blocked off until Conker earns a certain amount of cash. Each level is an enclosed area in which the player can freely explore to find tasks to do. The gameplay mostly relies on figuring out a way to help other characters by completing a linear sequence of challenges. These challenges may include defeating a boss, solving puzzles, gathering objects, and racing opponents, among others. The result is always a cash reward, which aids access to other areas in the overworld. Conker’s abilities are far simpler than those of previous Rare platform games Banjo-Kazooie and Donkey Kong 64. The player can run, jump, and smack enemies with a frying pan. Conker also has a few other physical abilities. He can swim underwater for a while until he runs out of breath, climb ladders or ropes, and is strong enough to push heavy objects. To regain lost health, Conker can eat pieces of “anti-gravity” Chocolate that are scattered throughout the levels. Additionally, the game employs “context sensitive” pads that allow Conker to gain different, temporary abilities when pressing the “B” button atop them. For instance, in the beginning of the game, by pressing the B button on the first pad he encounters, Conker drinks some Alka-Seltzer to wipe out his hangover, at which point players can proceed forward. Some pads can turn Conker into an anvil to slam into the ground, and some are also used to pull out his shotgun, to activate his throwing knives, slingshot and so on. They also serve to inform players of what needs to be done next. 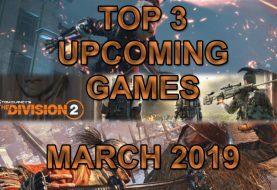 The game also includes a multiplayer mode, where up to four players can compete against each other in seven different game types: Beach, Raptor, Heist, War, Tank, Race and Deathmatch. In Beach, some players must go up through a beach and into a waiting escape vehicle, while others must stop them by firing at them from fixed positions. Raptor involves players controlling raptors to feed a baby dinosaur, while others play as cavemen that have to steal dinosaur eggs. Heist engrosses players in the robbery of a bank, where the goal is to retrieve a cash bag from the center of the level and run with it to the team’s vault without being damaged. War can either be a traditional capture the flag mode or Total War, where players have to get the other teams gas canister and use it to release a chemical gas that annihilates the enemy. 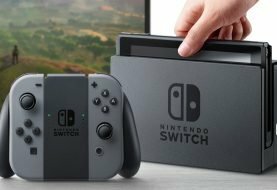 Similarly, in Tank players fight against each other by using tanks and grabbing chemical canisters that can release a lethal corrosive gas, destroying all the tanks that are outdoors. Race is a racing mode which provides two variations of the same course. Items can be acquired and used against opponents. Finally, there is a standard deathmatch mode where players fight against each other in shooting style from a third-person perspective. Players can set a number of different options for each game, such as score limit, number of lives, and inclusion of optional bots. Conker’s Bad Fur Day follows the story of Conker the Squirrel, a red squirrel, who finds himself lost in a strange land after a night of binge drinking with his friends, and embarks on a quest simply to return home to his girlfriend, Berri. Meanwhile, the Panther King, ruler of the land that Conker is lost in, finds that his throne’s side table is missing one of its legs and orders his paraplegic weasel servant, Professor Von Kriplespac, to solve the problem. Kriplespac suggests the use of a red squirrel as the fourth leg for his table, and therefore the Panther King sends his minions to search for one and capture it. As Conker searches for his way home, he finds himself embroiled in a series of increasingly absurd and often dangerous situations, including having to recover a bee hive from some enormous wasps, confronting a giant opera-singing pile of feces, being turned into a bat by a vampire, and even getting drafted into a war between grey squirrels and a Nazi-like group of teddy bears known as the “Tediz,” which Conker ultimately destroys. During his quest to return home, Conker finds wads of cash scattered throughout the land and becomes sidetracked from his goal. In the final chapter of the game, Conker and Berri are enlisted by Don Weaso, head of the Weasel Mafia, to rob a bank. After entering the vault, they find that the bank scene was an elaborate trap set by the King and Don Weaso to capture Conker. In the ensuing confrontation, Berri steps in to handle the confrontation for Conker, but is gunned down by Weaso under orders by the Panther King. Afterwards, he calls over Professor Von Kriplespac when he begins having trouble breathing, and Von Kriplespac takes Conker aside to watch as a large Xenomorph suddenly bursts out of the Panther King’s chest, killing him instantly. Von Kriplespac explains that the alien, whom he had named Heinrich, is one of his creations and that he had planned to use this opportunity to kill the King and escape captivity. Kriplespac then reveals that they are all actually inside a spaceship, which he activates and takes into low orbit. From there, he instructs Heinrich to attack and kill Conker as revenge for destroying the Tediz, which were also his creations. Conker pulls a switch that opens an air lock, pulling Von Kriplespac and Berri’s corpse into space. After Conker briefly battles Heinrich with the aid of a robotic suit, Heinrich takes one last lunge at him, when suddenly the entire game freezes. Conker expresses disbelief that the developers of the game apparently did not beta test the game properly, and breaks the fourth wall to ask some software engineers to assist him in his current situation. The programmers give Conker a Katana and teleport him to the Panther King’s throne room, where he decapitates Heinrich. As a result, he is crowned the new King of the land. As characters from the previous chapters of the game gather around to congratulate him, Conker realizes that he should have brought Berri back to life when he was negotiating with programmers. He calls them out to bring her back to life, only to realize that they have left already. Conker then gives a closing monologue, in which he discusses appreciating what one already has instead of always wanting more, stating that “the grass is always greener, and you don’t really know what it is you have until it’s gone.” The credits roll, and afterwards Conker is seen back at the same pub he was seen in at the start of the game, drowning his sorrows in Scotch whisky. He drunkenly exits the bar as it begins to storm outside, and leaves in the direction opposite the one he took previously. 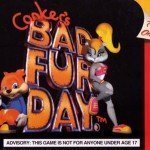 After the release of Conker’s Bad Fur Day, Rare began development of a direct sequel referred to as Conker’s Other Bad Day. Chris Seavor revealed that the game would deal with “Conker’s somewhat unsuccessful tenure as King. He spends all the treasured money on beer, parties and hookers. Thrown into prison, Conker is faced with the prospect of execution and the game starts with his escape, ball and chain attached, from the Castle’s highest tower.” However, the sequel was ultimately cancelled. In 2002, Rare was purchased by Microsoft and decided to develop a remake of Conker’s Bad Fur Day. The remake, titled Conker: Live & Reloaded, was released for the Xbox in 2005 to generally favourable critical reception. Developers noted that it was difficult to port the game to the Xbox system because Bad Fur Day‘s microcoded performance optimisations had been deeply customised for the Nintendo 64 hardware. :2:25 Conker: Live & Reloaded features updated graphics and a multiplayer mode that supports the Xbox Live service. Additionally, some aspects in the single-player mode were adjusted: several minor obscenities within the voice dialogue that are present in the Nintendo 64 game were censored at Microsoft’s request, the camera control was refined and improved with a zoom function, and an auto-targeting system was added to the game. After the release of Live & Reloaded, Rare began work on another game in the Conker universe titled Conker: Gettin’ Medieval. The game was to be multiplayer focused and did not feature Conker as a main character, with Rare instead hoping to focus on other characters in the series. However, the game was ultimately cancelled. Conker returned in a new episodic campaign for the sandbox game Project Spark. The campaign, titled Conker’s Big Reunion, is set ten years after the events of Bad Fur Day and Seavor reprised his voice roles. The first episode of the campaign was released in April 2015, but the remaining ones were cancelled the following September. Conker’s Bad Fur Day is also included as part of the Rare Replay compilation for Xbox One. The compilation was released on August 4, 2015.